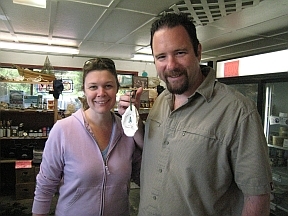 Several years ago Cait and John stopped by our farm and collected oyster shells, saying they were going to use them in their wedding at the nearby Alderbrook Resort. At the time we didn't think anything of it, but now we think they're geniuses. 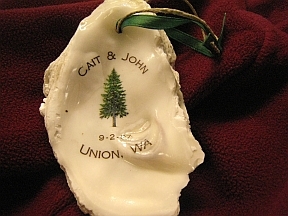 Turns out that they turned the oyster shells into keepsake wedding ornaments. Yesterday they dropped off one of their creations and gave us the recipe. First they printed clear decals on their computer, then they attached them to the oyster shell, and then they double dipped the shells in a clear polyurethane. Easy.